Map showing general operating areas for 2017 expeditions. Image courtesy of the NOAA Office of Ocean Exploration and Research. From December 2016 through September 2017, a team of NOAA and external partners will conduct the third year of the ‘Campaign to Address Pacific monument Science, Technology, and Ocean NEeds (CAPSTONE)’ field effort. 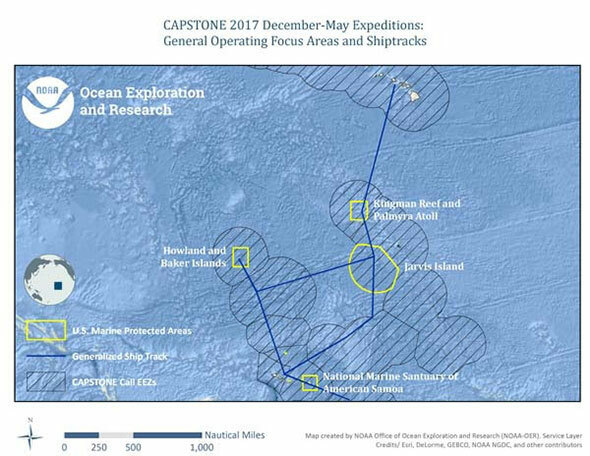 CAPSTONE is a major multi-year foundational science effort focused on deepwater areas of U.S. marine protected areas in the central and western Pacific. The investment provides timely, actionable information to support science-based decision making. An overview of CAPSTONE goals and science themes is available here. While the focus of 2017 operations remains within U.S. waters, NOAA is proud to be partnering with several Pacific Island countries and territories (PICT) to expand the CAPSTONE effort internationally in support of the Pacific Oceanscape Framework and Big Ocean , the network of the world’s large scale marine managed areas. In all locations, a multidisciplinary team of scientists, technicians, and engineers – both on board the ship and on shore – will conduct undersea mapping and remotely operated vehicle (ROV) explorations of the geological, biological, archaeological, and chemical features of these vast areas. Throughout the year, telepresence technology will allow you to follow discoveries via the NOAA Ocean Explorer website, putting the unexplored ocean directly into your hands. NOAA is seeking scientists and managers interested in actively participating during some or all of the 2017 expeditions. For details on opportunities to get involved, please visit this page. If you are interested in providing input into expedition planning or participating as a scientist or student, please contact the CAPSTONE Science Advisor, Dr. Christopher Kelley at ckelley@hawaii.edu. 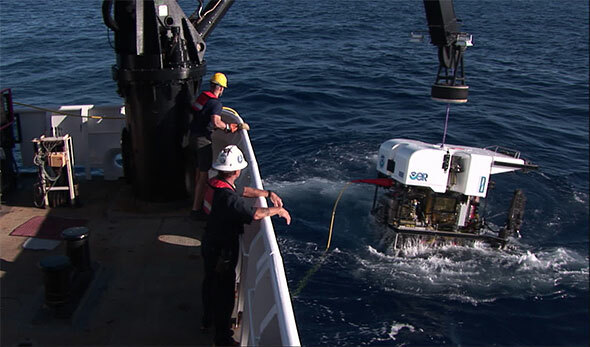 ROV Deep Discoverer is recovered after a successful dive. Image courtesy of the NOAA Office of Ocean Exploration and Research. In preparation for 2017 Okeanos Explorer expeditions, NOAA will conduct two cruises dedicated to thoroughly testing, troubleshooting, and calibrating all critical science equipment following off-season repair and maintenance. This work is called a ship “shakedown” and is essential in ensuring the ship is fully ready for upcoming expeditions and will collect the highest-quality data possible. Both cruises are in and out of Honolulu, Hawaii, and will focus on targets in the vicinity of the main Hawaiian Islands. The first cruise is focused on ROV and telepresence system shakedown. The second is dedicated to mapping and continued telepresence shakedown. 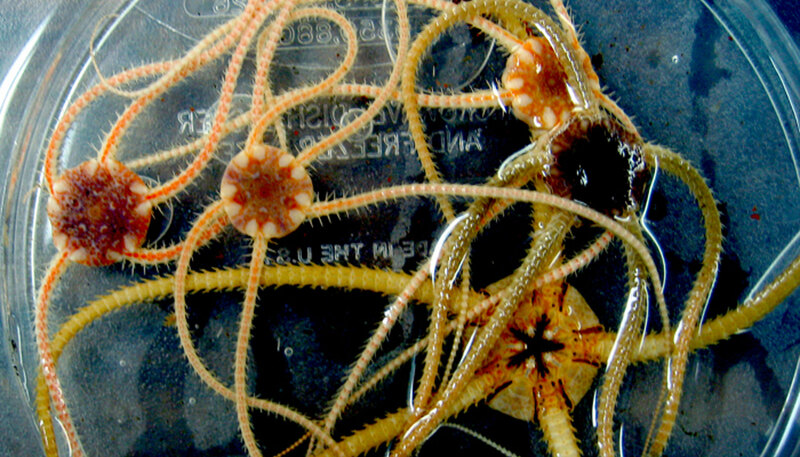 Numerous small ophiuroids recovered in 2005 from the outside flanks of the Vailulu'u underwater volcano near American Samoa. Image courtesy of Vailulu'u 2005 Exploration, NOAA-OE. This series of three non-consecutive cruises includes substantial work in U.S. marine protected areas, the high seas, and several PICTs. Multiple port calls are anticipated in Apia, Samoa and Pago Pago, American Samoa. A total of ~70 days at sea will focus on ROV and deepwater mapping operations in the vicinity of the Kingman Reef and Palymra Atoll, Jarvis Island, Howland and Baker Islands units of the PRIMNM; Republic of Kiribati’s Phoenix Islands Protected Area (PIPA); New Zealand Territory of Tokelau; and Cook Islands. These cruises also include any 2017 NOAA Ship Okeanos Explorer work on the high seas between Honolulu and Kingman/Palmyra. The work in the vicinity of Kingman/Palmyra and Jarvis units of the PRIMNM is expected to complement past mapping efforts through the U.S. Extended Continental Shelf Project. All PIPA work will be designed to complement a subsequent Schmidt Ocean Institute’s R/V Falkor expedition and multiple previous cruises by SEA Semester ’s SSV Robert C. Seamans. Cook Islands work will inform Cook Islands-New Zealand discussions about a potential outyear effort on NIWA’s deepwater research vessel Tangaroa . Several of the areas were briefly visited in 2005 during a series joint University of Hawaii - NOAA expedition on the R/V KOK with the Pisces submersibles. January 18 – February 10: Mapping operations starting in Honolulu and concluding in Pago Pago, American Samoa. The preliminary cruise track will pass through the Kingman/Palmyra and Jarvis units of the PRIMNM, transit west along the Nova-Canton Trough into PIPA, turn south along the Tokelau seamount trail, and pass through Tokelau on the way to port in American Samoa. March 07 - March 29: ROV and mapping operations starting and ending in Apia, Samoa. The preliminary cruise track will likely pass close by Swains Atoll in American Samoa before following the Tokelau seamount trail north through Tokelau and PIPA into the Howland/Baker Islands unit of the PRIMNM. The cruise will continue operations during the return to Apia via PIPA and Tokelau. April 27 - May 19: ROV and mapping operations starting in Pago Pago, American Samoa, and ending in Honolulu. The ship will conduct near-daily ROV dives as it transits across the northern portion of the Cook Islands, with focused work in the vicinity of both the Jarvis Island and Kingman/Palymra units of the PRIMNM prior to the final return stretch to Honolulu. 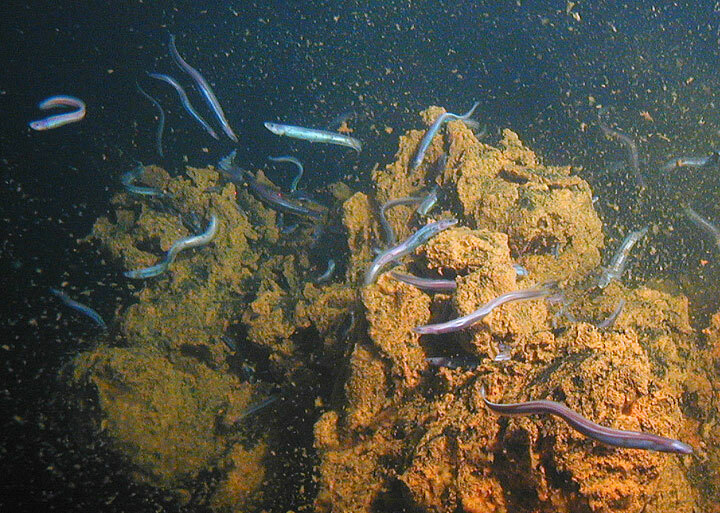 During a 2005 expedition east of Ta'u Island in American Samoa, swarms of small synaphobranchid eels, Dysommina rugosa, were seen living in the crevices on the summit of the underwater volcano Nafanua. Scientists dubbed this site 'Eel City.' Image courtesy of Vailulu'u 2005 Exploration, NOAA-OE. A total of ~32 days at sea during two non-consecutive cruises will focus on ROV and deepwater mapping operations in the vicinity of American Samoa, including work in both the National Marine Sanctuary of American Samoa (NMSAS) and the Rose Atoll Marine National Monument (RAMNM). Some additional work is also expected in Samoa. Port calls are anticipated in Apia, Samoa, and Pago Pago, American Samoa. February 16 - March 2: ROV and mapping operations starting in Pago Pago, American Samoa, and ending in Apia, Samoa. The vast majority of time will be spent within the waters of American Samoa, including but not limited to, work within both MPAs. April 4 - April 21: Mapping operations starting in Apia, Samoa, and ending in Pago Pago, American Samoa. The majority of time will be spent within the waters of American Samoa, including but not limited to, work within both MPAs. 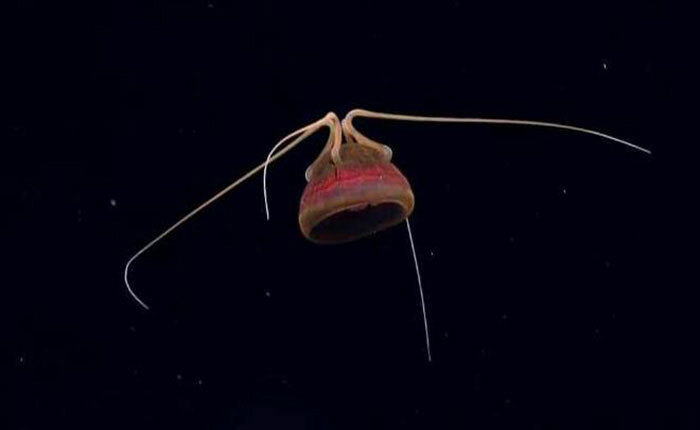 This unusual jellyfish was seen during the 2015 Hohonu Moana: Exploring Deep Waters off Hawaii expedition, on a dive at Deep Twin Ridge within the Johnston Atoll region. Image courtesy of the NOAA Office of Ocean Exploration and Research, 2015 Hohonu Moana. Two consecutive cruises totaling ~41 days at sea are dedicated to ROV and deepwater mapping operations in the vicinity of the Johnston Atoll unit of the PRIMNM. The work will be designed to complement past work by the U.S. Extended Continental Shelf Project, an expected January 2017 Schmidt Ocean Institute expedition on R/V Falkor , and the 2015 CAPSTONE effort. June 20 - July 08: Mapping operations starting and ending in Honolulu. The vast majority of time will be spent within the waters of the Johnson Atoll unit of the PRIMNM. July 13 - August 03: ROV and mapping operations starting and ending in Honolulu. The vast majority of time will be spent within the waters of the Johnson Atoll unit of the PRIMNM. In 2015, while transiting from Honolulu to the first dive site of the 2015 Hohonu Moana expedition east of Necker Island, the Okeanos Explorer mapped an unnamed 2,865-meter-high seamount whose peak is 562 meters below the surface of the water, with surrounding water depths of 4,709 meters. Image courtesy of the NOAA Office of Ocean Exploration and Research, 2015 Hohonu Moana. Two consecutive cruises totalling ~47 days at-sea are dedicated to ROV and deepwater mapping operations in the vicinity of the Musician Seamounts north of the Hawaiian archipelago and in close proximity to the recently expanded Papahānaumokuākea Marine National Monument. August 09 - September 01: Mapping operations starting and ending in Honolulu. September 07 - September 29: ROV and mapping operations starting and ending in Honolulu.